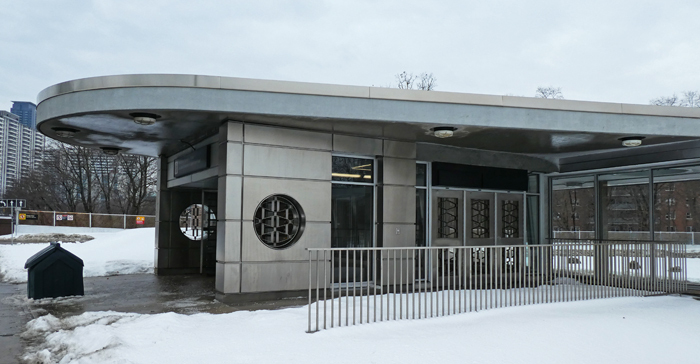 This is one of the exits from the Castle Frank subway stop that was added in 2012 but which goes nicely with the style of the original station which opened in 1966. I love the modernist look of it. I like the look of the building too! It's quite attractive. I like it. I have heard of the station but have not been through it. It looks rather smart. Welcome shelter from the snow and rain too. Soon it will belong to Doug Ford. PS: Yes I am staying indoors today. A very attractive building, I like it too. That is a fine looking subway stop in Deco style. I've always like Deco style. I do like those curving lines - Beautiful! It's nice to see that style in a contemporary building. I like it. The building is nice but it still looks c-o-o-o-o-l-d! I like the style of it too. Oh I really like this design too, and it lends the feeling of Art Deco too!